The Tripura Board of Secondary Education (TBSE) will declare the Tripura Board Result 2019 for Class 10 and Class 12. 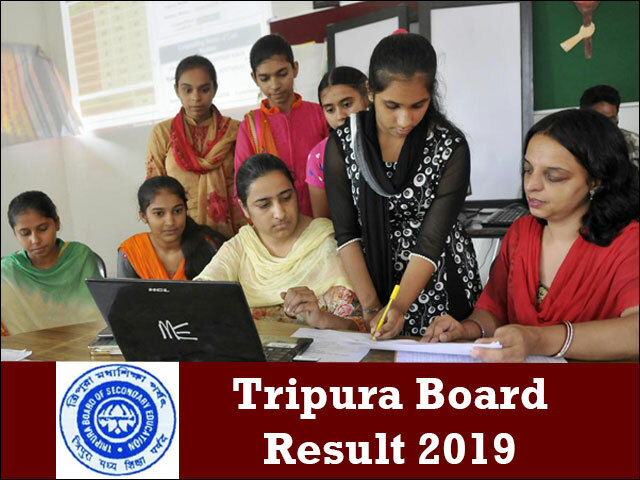 The Tripura Board 2019 result for Class 12 will be declared by the last week of May while the Class 10 result will be declared by the first week of June tentatively. After the formal declaration from the board office in Gorakhbasti, Agartala; the TBSE HS (Class 12) result and TBSE Madhyamik (Class 10) result 2019 will also be made available online for the convenience of the students. Students will be able to check their results on the official website of TBSE. Alternatively, the Tripura Board result 2019 will also be made live on this page and students can also easily access their result here. It is advisable that students bookmark this page to receive regular updates on all the information related to Tripura Board result 2019. The Tripura Board of Secondary Education has released the time table for Tripura Class 10 and 12 Board exams. However, the officials have refrained from disclosing the declaration date of Tripura Board result 2019. As such, different speculations are being made about the declaration date of Tripura Board result 2019. It is, therefore, likely that various rumour mills will suggest different declaration dates of Tripura Board result 2019. We hereby urge the students not to believe in such rumors and trust authentic information only. If the trends from the past year are to be believed, the most likely declaration date for Tripura Board result 2019 is the last week of May for Class 12 and the 1st week of June for Class 12. We will provide timely updates about the declaration date of Tripura Board result 2019 on this page. JagranJosh also provides the facility where students can have the updates delivered directly to their email inbox. To access this facility, register with us by providing your mobile number and email id in the form available on the top of this page. Where to Check Tripura Board Result 2019? The TBSE Madhyamik and Higher Secondary Exams will be conducted in the month of March and April by the Tripura Board of Secondary Education. Although much has not been disclosed about the result declaration date, taking cue from the past years trends, the results will most likely be announced by the last week of May/1st week of June. After the official declaration of Tripura Board Results from Pragya Bhawan office, the TBSE 10th Result and TBSE 12th Results will be made available online on the official websites i.e. http://tsu.trp.nic.in/tripuraresults or http://tripuraresults.nic.in or tbse.in. Students will be able to check their Tripura Board 2019 result from these websites. The students may, however, face difficulty in checking the TBSE HS Result and TBSE Madhyamik Result on the official websites due to some technical errors and this creates unnecessary anxiety. So as an alternative solution, students can also check their result on tripura10.jagranjosh.com or tripura12.jagranjosh.com, where we have made the process of result checking is hassle-free. The students are advised to frequently visit this website to know all the updates regarding TBSE Madhyamik and HS result and other updates of the board. Once the results are being announced, the students can check them directly from this page and also download the scorecard or take a printout for future reference. An overview of the statistics of the previous year Class 10 and 12 exams of Tripura Board is provided below for the benefit of the students. The Tripura Board Class 12 result for Science Stream was declared on May 22 last year while the result for the Humanities and Commerce streams was declared on June 8. The analysis of the same is provided below. How to Check Tripura Board Result 2019? Take a printout of the scorecard for future reference. Once the Tripura Board exams 2019 are concluded, a large number of speculations regarding the Tripura Board result 2019 will be made. This makes obtaining important and authentic information about the TBSE Result 2019 quite a task. As an effective solution, jagranjosh.com will be providing all the latest updates on their Tripura Board Result 2019 pages for Tripura Board 10th Result 2019 and Tripura Board 12th Result 2019. JagranJosh will provide the TBSE Result 2019 link on their dedicated Tripura Board Madhyamik Result 2019 and Tripura Board HS Result 2019 pages as well. Students can also register with us for email alerts service under which regular and timely updates regarding the upcoming Tripura Board Result 2019 will be shared with you via email. To start receiving these important updates, submit your mobile number and email ID on this page. What after Tripura Board Result 2019? After checking the Tripura Board result 2019, students should download and take a printout of the result page for future purposes. The Tripura 10th Result 2019 or Tripura 12th Result 2019 will be available through the above links. The downloaded copy of the Tripura Board result 2019 will act as a provisional result status until the original marksheet are issued by the respective boards. The original mark sheets will be sent to the respective schools within the stipulated time after the declaration of Tripura Board Result. Students must compulsorily collect their Tripura Board result 2019 original marksheet as it will be required for all official purposes. Students unsatisfied with the marks obtained in Tripura Board result 2019 can apply for re-evaluation and re-checking their answer sheets. This facility allows the students to double check if their answer scripts have been properly evaluated. To apply for rechecking/re-evaluation students need to pay a nominal fee as directed by the TBSE and submit an application through their respective schools/institutions. Students unable to pass in the Tripura Board exam 2019 will have the option to appear for Tripura Board Supplementary/Improvement Exam. This exam gives the candidates with a second chance to improve their scores in a single or multiple subject(s). Students can apply for the Tripura board supplementary/improvement exam of by filling in the application form that will be made available on the official website of TBSE 2019. The Tripura Board of Secondary Education (TBSE) is a state agency concerned with providing quality education to all students in the state of Tripura. This TBSE Board was formed in 1973 through the Tripura Board of Secondary Education Act. The Madhyamik and HS exams are conducted every year by the board. There are numbers of schools, both private as well as government, affiliated with the board. The TBSE or Tripura Board of Secondary Education is entrusted with the responsibilities of forming the syllabus as well as selection of textbooks. The TBSE conducts the 10th and 12th exam annually. These exams are very important for the students to certify for higher education. The TBSE 12th exam is considered as a doorway of higher education for the students of Tripura. This result plays a crucial as well as a decisive role in building the future path of the appeared students. The main mission of the board is to form a strong base for higher education which must be effective for all students of Tripura.